1. Turn the valve handle of the recharge hose counterclockwise until the piercing stem is in the up position. This will prevent accidental piercing of the Super Seal can. CAUTION: Do not add Super Seal through a manifold gauge and hose set. Use only enclosed recharge hose. 2. Shake can well. Screw the recharge hose onto the top of the Super Seal can. 3. Locate the low-side service port of the vehicle's air conditioner and remove the protective cap. 4. Attach the quick-connect fitting on the recharge hose to the service port by pulling the connector ring back as you push the fitting onto the service port. Make sure the fitting is tight. DO NOT CONNECT TO THE HIGH-SIDE SERVICE PORT AS THE PRESSURE MAY CAUSE THE CAN TO BURST, RESULTING IN SERIOUS INJURY! 5. Start the engine and turn the air conditioner to maximum cooling. Make sure the compressor is running. If compressor is not running, add a maximum of one can of refrigerant. Repairs are necessary if compressor still does not run. 6. Turn the valve handle of the recharge hose clockwise until the piercing stem has punctured the Super Seal can. 7. Turn valve handle counterclockwise until you hear Super Seal leaving the can. 8. Hold the Super Seal can in an upside-down position until the can is empty. 9. Disconnect the recharge hose from the low-side service port. Remove the Super Seal can from the recharge hose and discard. Turn the valve handle of the recharge hose counterclockwise until the piercing stem is in the up position. 10. 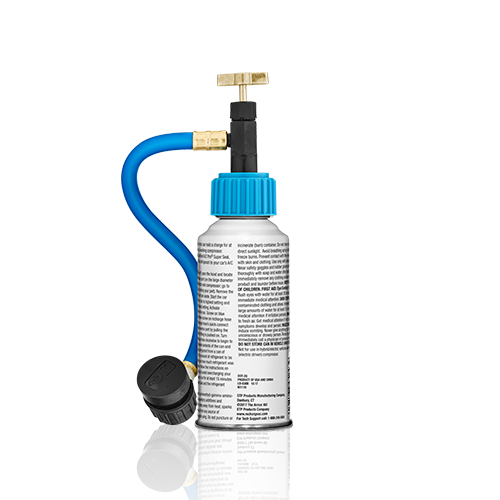 Immediately add additional refrigerant to fully charge the system. 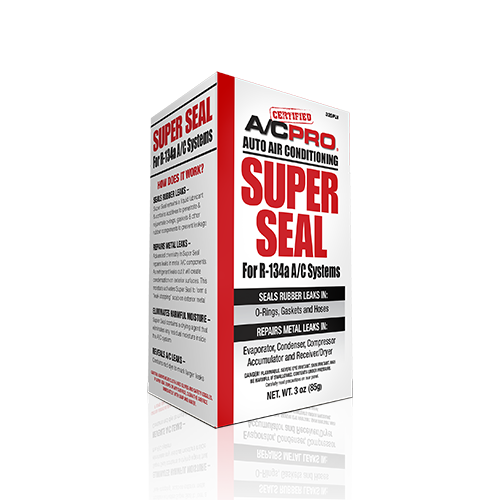 This prevents Super Seal residue from sealing the service port. 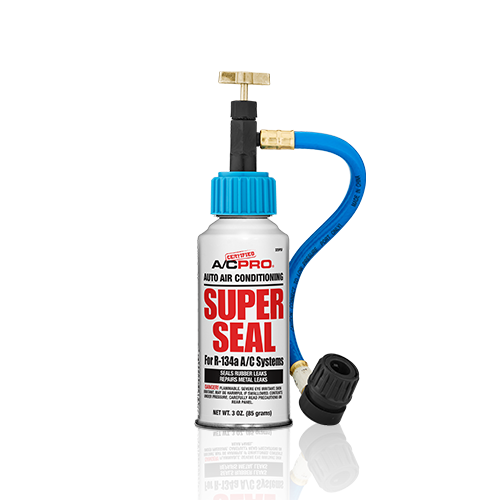 Caution: if the Super Seal recharge hose is not being used to charge the system with refrigerant, it must be flushed with petroleum cleaning solvent or soap & water to prevent Super Seal from activating and sealing the hose. 11. Screw the recharge hose onto the R-134a Refrigerant can. Reconnect the recharge hose to the low-side service port. 12. Puncture the R-134a Refrigerant by turning the valve handle clockwise. Then turn the valve handle counterclockwise until you hear the refrigerant leaving the can. 13. 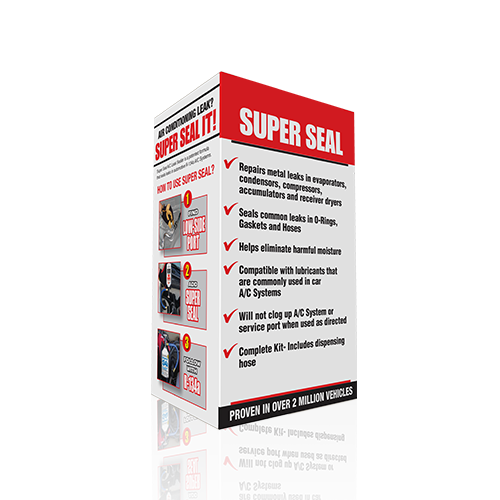 Charge your system with as much refrigerant as needed. 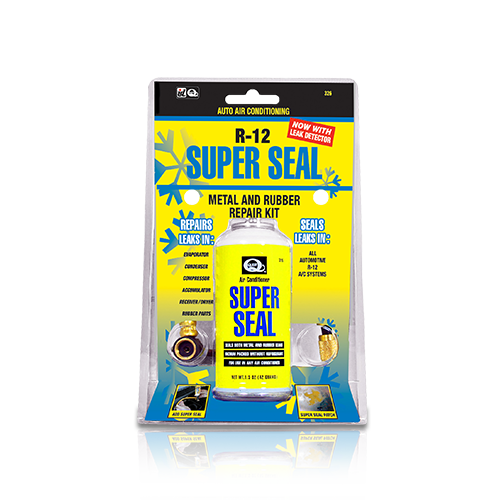 Allow the system to run for 15 minutes to let the Super Seal and refrigerant circulate. 14. Always store the recharge hose with the piercing valve in the up position. This prevents accidental piercing of the next can.